Yeah i ended up using Package Build and slightly modifying it to support my project. Working a lot better now. I tried build Release of blank project and can't initialize engine. Then try run >> "..\My Project\My Project_package\bin\win_x64_release\GameLauncher.exe"
Command Line: "D:\MyProgs\My Project\My Project_package\bin\win_x64_release\GameLauncher.exe"
Messagebox: cap: Engine initialization failed text:Attempting to start the engine without a project! Please use a .cryproject file! Messagebox: cap: Engine initialization failed! text:CrySystem initialization failed! Is there a config.pak file in the root folder of your packaged build? And if you open it with 7zip or Winrar does it contain a game.cryproject file? Or does the system.cfg set a different project name? With build Profile all ok. But when I try simply build Release - then can't run - you see that at previous post. What me need to correct run game ? Or better give me step-by-step manual how package Release build. Encountered and error while running command '"C:\Crytek\Crytek\CRYENGINE_5.5\Tools\7za.exe" a -tzip "D:\MyProgs\MyPr125\MyPr125_package\config.pak" "D:\MyProgs\MyPr125\MyPr125_package\game.cryproject" -mx0'! I'm not sure why this happens though. It looks like it manages to copy the game.cryproject file to your package root folder. But for Release builds the cryproject file has to be in a pak file, otherwise it won't read it. This is probably why it works for you in a profile build but not in a release build. As a workaround you can archive the game.cryproject file in a zip file with a tool like 7-zip, and rename the archive to config.pak. In Profile build same error in console, but game run. I tried to manually add Game.cryproject before and tried after build - but still have this error and can't run game. Tried also archive to config.pak - no changes - game no run. Maybe you record video and upload to YouTube how to do Release Build ? I had seen - not matter if put "..\MyPr125_package\Game.cryproject" - Game.cryproject always removed from there after build and same error. It works for the profile build because profile builds are allowed to read loose files from the hard-drive. But for release builds it is restricted to only read from files in a pak file, which is why it won't load the project unless it is in a config.pak file in the root folder of the build. 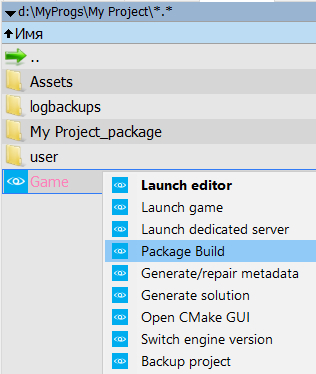 Normally what the package build system does is it copies your cryproject file over to the folder of your build. From there it tries to package it in a config.pak file, and if successful it will delete the .cryproject file because it's already in the config.pak. If it's not successful it should rename it to game.crygame instead, but this will only be usable for non-release builds. Can you try copying over the game.cryproject file to your packaged build, and then use a program like 7-zip, winzip or winrar to archive the file into config.pak? Make sure that the archive is in a zip format, and not 7zip or rar format. Also make sure that in the system.cfg file it refers to the right project file. There is a known issue that the 7za command line tool we use is missing its dependent library in the current preview release. To fix this for now you can download the 7zip command line package from here and extract/overwrite the files 7za.exe and 7z.dll into the CRYENGINE/Tools folder.